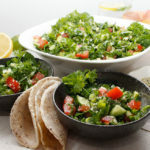 Enjoy this quick-to-make Garden Fresh Tabbouleh Salad as a side, in a wrap or mixed with some of your other favourite dishes and your meals will never be boring again! Go ahead and modify this version with ingredients you have on hand! Toss all ingredients in a large bowl with your hands or spoon and enjoy! Make sure to toss the salad again right before your meal as the dressing will most likely collect at the bottom of the bowl. This salad will keep in the refrigerator for a few days. If you follow a strict gluten-free lifestyle make sure your seeds (hemp, sunflower, pumpkin) are certified gluten-free.